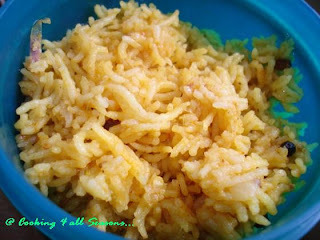 Tomato Rice or Tomato Pulao brings back fond memories of many occasions. It has always a part of the standard menu that I make for my sister in laws when they visit us. Since they don't make this variety of rice, they always look forward to me making this during their visit. Though I have shared the recipe with them many times, they always feel they never get it the way I make. Tomato Pulav is again a dish I learnt from Amma. I always say if mine turns out good, her version turns out out of the world. I have in due course changed few things to my taste. But essentially it's the old dear tomato rice of Mom's special. Since cooking at parents place is always for a huge crowd, I am very comfortable cooking in large quantity. The first time I cooked for just two of us, it was a big flop. I still remember that day in office, when I eagerly opened the box to dig in and to my utter dismay, realized it was so salty! God I was scared to call up hubby dear! He knew I can cook and he always loved whatever was prepared. But that look always appeared as if to ask did you cook it all by yourself or did amma help you. Now it looks like he got proof! I didn't say anything for fear that I might put myself in soap. So when I called up, I was asking about everything but the lunch. He simply asked, "What, you added salt twice is it to the Rice? It was quite salty but the colour looked lovely red!" Boy, since then I never fail to look at the salt spoon twice before adding to this rice! That was five years ago. Feels ancient though, thinking about it. The naive feeling when we do something on our own and look forward to be appreciated is something so universal I guess. Even now, when I make a new preparation and serve to hubby. I keep looking at him like a hawk, ready to pounce the question "how does it taste!" At times, I will pop the question before he can even take a bite. My inlaws got introduced this dish when we were living with parents. They always loved the Tomato Rice that Amma makes. When we moved on our own, it was only natural that , I included this to their standard menu and yes, it always comes out well. Another incident that comes to mind was, during one of their visits, we had unexpected guests. We asked them to stay back for lunch. 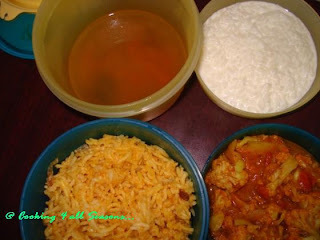 The lunch was tomato rice, I already had two cookers with this rice, I had to hunt for another one to prepare! I was in a real fix, hoping I had all the ingredients for making more. Since we were ourselves numbering to 20, I made enough for everybody, but wasn't sure if it will be enough for four more. I was really very happy in the end to see that it was enough for all and they were surprised at the quantity I prepared. 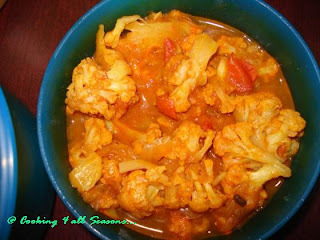 We always pair the Tomato Rice with Cauliflower Sabji, but on that day I couldn't prepare for that huge crowd and made do with Onion Raitha. I especially liked the close up rice shot. So got into capturing something to look decent after seeing all those wonderful and sinful pictures. I know I could've taken better ones, but unfortunately I can't do yoga unlike them!